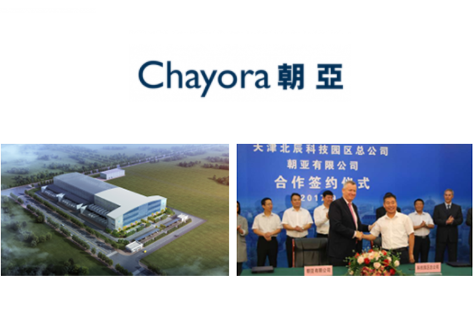 Sicoya GmbH, which specializes in monolithically integrated Silicon Photonics, announces the build of a new factory in Tianjin, China focusing on assembly and test of optical transceivers and engines. The factory installation includes anti-vibration foundations and clean room facilities that will allow the factory to perform CMOS wafer level post-processing steps and downstream packaging processes. Sicoya says the facility will serve the Chinese market and will manufacture transceivers and engines for the 5G wireless fronthaul and 100G/400G Ethernet-based datacenter application utilizing Sicoya's monolithically integrated Silicon Photonics chips. "The Chinese Market is very important for Sicoya and customers require local manufacturing and services at scale," said Dr. Sven Otte, CEO of Sicoya. 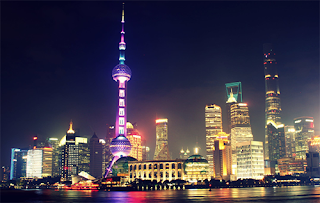 International customers in the US or Europe will be served out of both the factory in Tianjin and complementary out of the factory in Berlin, Germany. "We need to stay flexible with respect to the installed capacity of the two factories," said Peter Neumann VP of Operations at Sicoya. "In the past the industry tended to consolidate operations in one place to gain scale and utilization of overhead cost but today staying flexible and being able to react quickly to changes in the political environment becomes a key asset that customers appreciate," he continuous. The Pakistan East Africa Cable Express (PEACE) Cable project, which will connect Asia, Africa and Europe, has entered into the cable and material manufacturing stage. The PEACE cable system will span 12,000 km and is designed for 200G, 16Tbps per fiber pair connectitivity. The ready for service date is targetted for first quarter of 2020. The project is being developed by PEACE Cable International Network Co., Ltd, a subsidiary of China's HENGTONG Group. 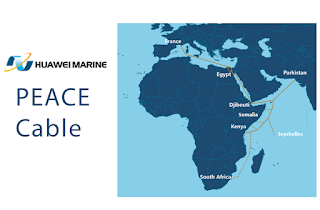 Huawei Marine Network is lead contractor. China Construction Bank is funding the project. Tropic Science Co. is a signatory partner. Top Chinese government officials are reviewing a proposal to merge China Telecom and China Unicom, the nation's number 2 and 3 mobile operators, according to reports published by Bloomberg and others on Tuesday. So far, there has not been official confirmation of the story although share prices of both companies have risen on the Hong Kong exchange. Combined, the two carriers have 590 million mobile subscribers, compared to 905 million for China Mobile. A merger would enable a faster rollout of 5G but reduce the competitive landscape for mobile services to two players. Both carriers have reduced CAPEX in the first half of 2018 following completion of most 4G upgrades. Both reported surging mobile data traffic and an impact from increased competition and the elimination of provincial roaming charges. Exactly one year ago, the Chinese government arranged for top Chinese tech companies, including Alibaba and Tencent, to inject RMB 78 billion (US$11.7 billion) into China Unicom in an effort to accelerate the transformation of its network. The consolidation could play to the favor of these investors. As state-owned enterprises, both China Telecom (estimate 287,000 employees) and China Unicom (estimated 252,000 employees) have large numbers of workers and retirees. While network integration and automation may reduce the need for so many employees from a technical perspective, from a social point of view, large-scale reductions may not be possible. The big synergy in the merger presumably would be to reduce the rollout cost of a nationwide 5G network, which both China Telecom and China Unicom were anticipating in 2020. Both carriers have 5G pilots underway and limited trial services are expected in 2019. Full-scale nationwide rollout for each would involve upgrades to millions of base stations, and improvements to front-haul and backhaul infrastructure. China Unicom recently disclosed that it now has 910,000 4G base stations in operation. 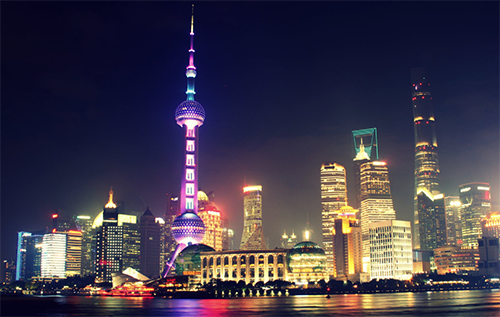 China Telecom has stated that it had 1.2 million 4G base stations in operation. Many 5G small cells and in-building networks are also required for the 5G upgrade plan. A merged entity presumably could build this at a much lower cost -- perhaps even approaching 50-60-% of what otherwise would be spent. 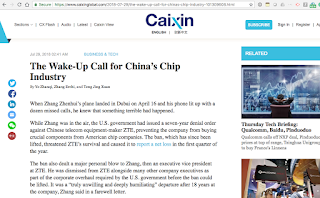 For network equipment, especially Huawei and ZTE, this could be bad news. For China Tower, which recently completed an IPO, this could mean only 2 potential clients on its telecom masts (China Mobile and this merged entity). With only two mobile operators, perhaps the really intense mobile price competition in China would ease. 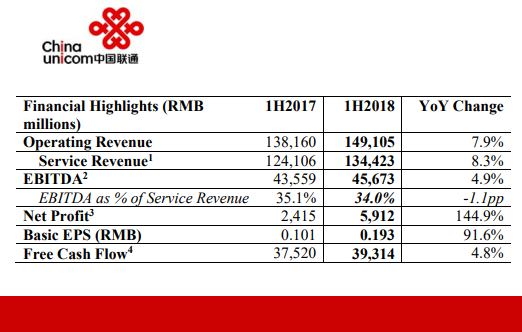 China Mobile must make do with ARPU of RMB 58.10 (US$8.43) -- about 1/6th the billing per subscriber per month as U.S. operators. China Telecom and China Unicom's mobile ARPU is lower, at RMB 47.9. This leaves very little profit potential per subscriber, making the business case for a deep, nationwide 5G rollout more difficult for two carriers than for one.. 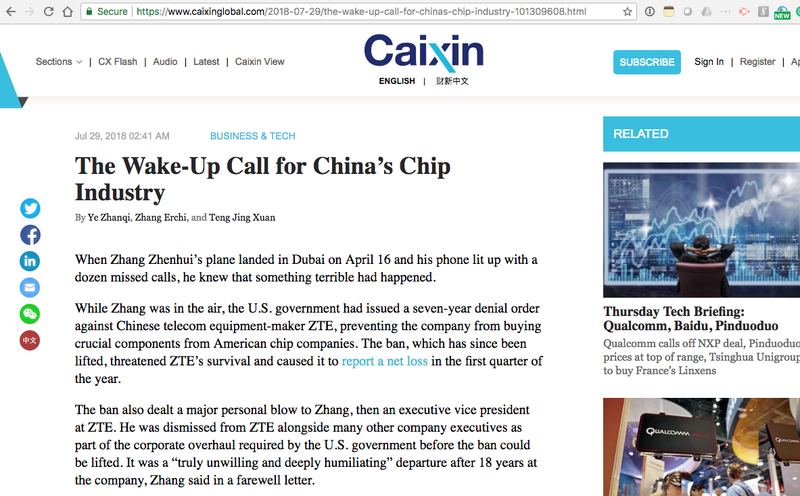 The near-death experience of ZTE due to the 88-day ban imposed the U.S. Department of Commerce is a wake-up call for China's semiconductor industry, according to an article in the business journal Caixin. The article the foreign joint venture model, Chinese investments/acquisitions of tech companies abroad, and government-supported initiatives to build a strong, domestic ecosystem for semiconductor design and fabrication. Nokia and Tencent, one of China's leading providers of Internet services, signed a Memorandum of Understanding covering joint research and development work to explore the potential of 5G for the provision of new applications, including those for a variety of vertical markets. 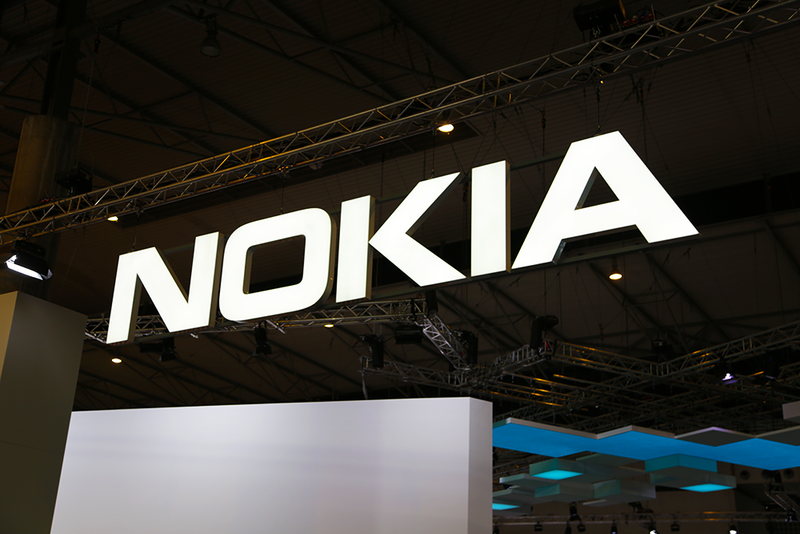 Nokia and Tencent will establish an end-to-end 5G test environment in Shenzhen. With 1.04 billion combined monthly active user accounts of its WeChat and QQ social media applications, Tencent aims to leverage the massive connectivity, increased speeds, capacity and reliability and lower latency enabled by 5G to enhance these services. Establishes a joint laboratory equipped with leading 5G technologies, products and solutions, including centralized and decentralized split architecture using Nokia Airscale Radio Access Network, 5G Core, MEC framework and third party devices. Leverages the capabilities of an end-to-end 5G testing environment. Nokia and Tencent will conduct verification on service key performance indicators and develop new 5G and IoT use cases. Zeng Yu, Vice President at Tencent, said: "We are pleased to collaborate with Nokia to leverage the technologies, products and expertise of both our companies to fufill the growing demands of a digital economy driven by 5G. Tencent and Nokia are fully committed to delivering richer, more diverse, multi-level services and applications for enterprises, and individual customers. Furthermore, we will support each other in creating more financial and social benefits in our respective fields, to pursue success in the new era of digital economy." 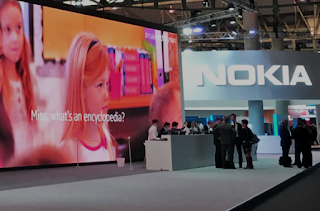 Marc Rouanne, president of Mobile Networks at Nokia, said: "This collaboration with Tencent is an important step in showing webscale companies around the globe how they can leverage the end-to-end capabilities of Nokia's 5G Future X portfolio. Working with them we can deliver a network that will allow them to extend their service offer to deliver myriad applications and services with the high-reliability and availability to support ever-growing and changing customer demands." At its second annual developer conference in Beijing this week, Baidu unveiled its "Kunlun" processor for AI applications. Technical details on the new Kunlun silicon were scarce, but the company said its cloud-to-edge AI chip is built to accommodate high-performance requirements of a wide variety of AI scenarios, including deep learning and facial recognition. Baidu is known to be developing FPGA designs for a number of years. Baidu also announced volume production of China’s first commercially deployed fully autonomous bus. The first 100 "Apolong" buses are ready for the road. Qualcomm is working with Gizwits, a global leader in Internet of Things (IoT) development platforms, to deliver the world's first commercial 2G cellular modules with field upgrades to LTE IoT (eMTC/Cat-M1 and NB-IoT/Cat-NB1). The Quectel BG36 module –aimed to be compatible with China Mobile's network and manufactured by Quectel based on the Qualcomm MDM9206 LTE IoT modem– will be powered by the Gizwits IoT cloud services and designed to help developers, device manufacturers and service providers to create economical 2G solutions, which are also designed to be flexible and long-lasting by supporting future over-the-air activation of NB-IoT and eMTC as the cellular ecosystem transitions toward the latest LTE IoT standards. 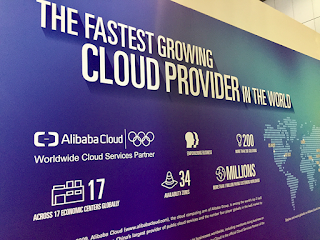 Alibaba Cloud is launching a proprietary ET Agricultural Brain service that taps into its AI technologies such as visual recognition, voice recognition and real-time environmental parameter monitoring. The AI program has been adopted already by a number of pig farms, where the Agricultural Brain monitors each hog’s daily activity, growth indicators, pregnancy and other health conditions, bringing more insight throughout the pig farming industry chain. The Bank of China and China Export & Credit Insurance Corporation (Sinosure) will provide US$200 million in long-term financing to Telecom Egypt. The financing was facilitated by Huawei. It is intended to finance the roll-out of Telecom Egypt's 4G network and the deployment of transmission and core networks. 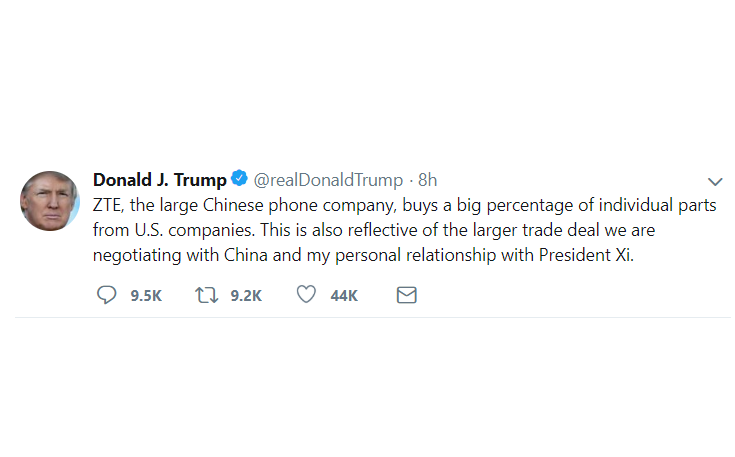 In a follow-up tweet regarding ZTE, President Trump defended his decision to intervene in the case with the Department of Commerce, citing on-going trade negotiations and his personal relationship with President Xi. Meanwhile, Wilbur Ross, Secretary of Commerce, said ZTE did "inappropriate things" referring to its violation of economic sanctions against Iran, but that his department would now consider "other remedies" instead of the current export ban of U.S. products to ZTE. 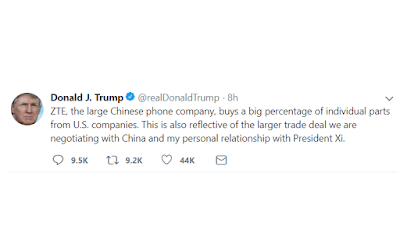 Media sources also speculated that China was using the delayed approval process for Qualcomm's acquisition of NXP Semiconductor as its own bargaining chip in the ongoing bilateral trade negotiations.